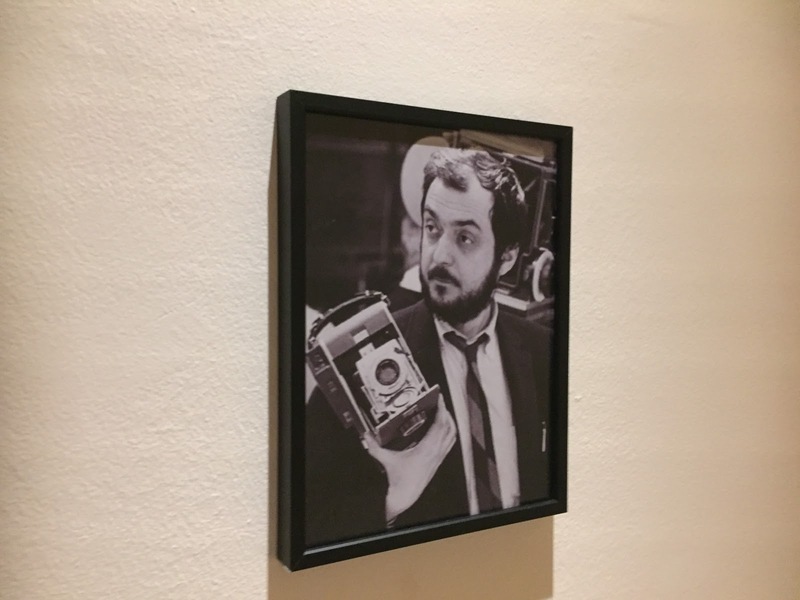 I wrote a while back on the Kubrick exhibition that’s steadily making its way around the globe, and what a treat it is for the fan of the great filmmaker. 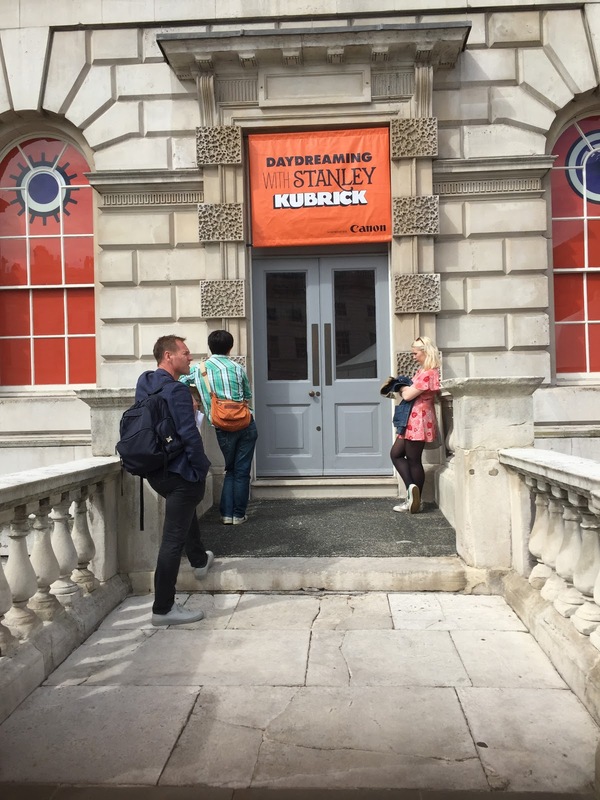 That show still hasn’t come to London, but I went to see the new Daydreaming with Stanley Kubrick yesterday, at Somerset House, and am reporting back to anyone interested and wondering whether it’s worth the trip. 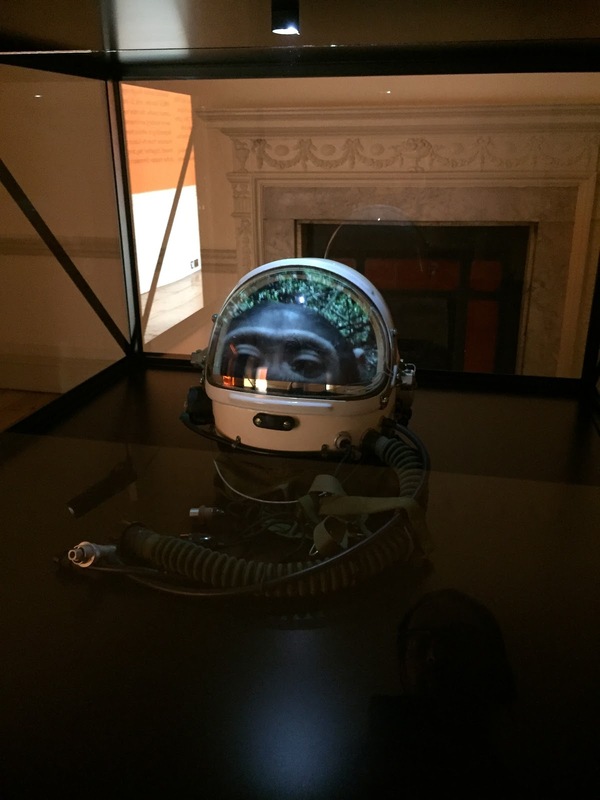 The show is described as a ‘new exhibition, curated by Mo’Wax and UNKLE founder, artist and musician James Lavelle, featuring a host of contemporary artists, film makers and musicians showcasing works inspired by Stanley Kubrick.’ Interesting idea, but are the results any good? Around 20 rooms line this spine of the show, containing a total of 45 pieces of work. 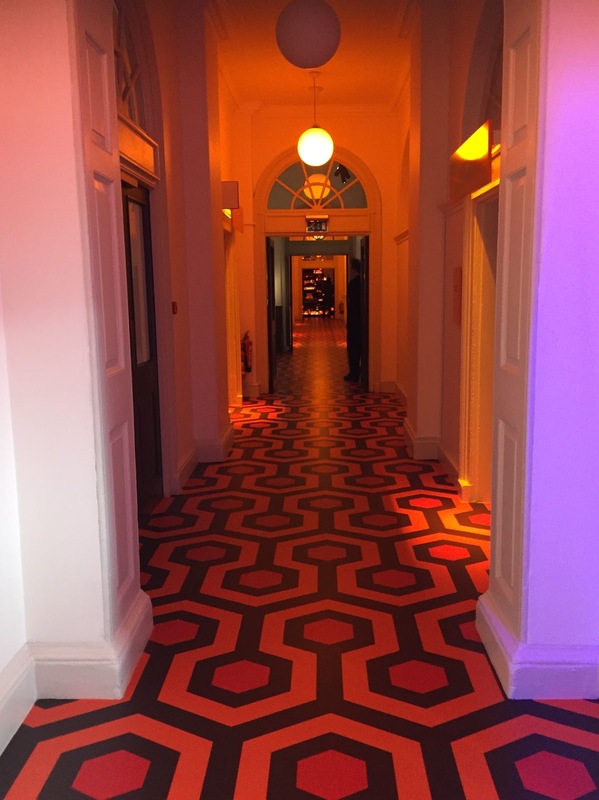 Some are very explicit references to Kubrick works, some less so, and take a moment or two to spot the connection to the film (or films) being alluded to. Here are one or two pieces I enjoyed the most. 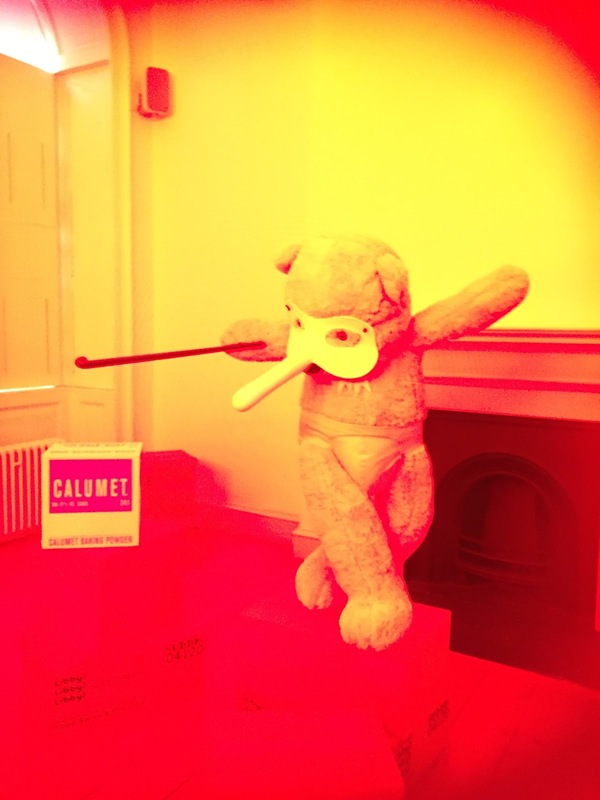 Room 7 (and it’s a shame they didn’t contrive a room 237) contains work by James Lavelle himself, amongst others, and includes this oversized teddybear referencing A Clockwork Orange, as well as numerous boxes from Jack’s imprisonment in the pantry of The Overlook hotel. The colour in this photo is more or less accurate, the room being lit by eerie red neon. This is a terrible photograph of something it’s impossible to capture in a still shot anyway – it’s a strobing LED light which is rather blinding in the darkness where it lies. There doesn’t seem much to it, so you look away quite quickly, and that’s when something weird happens. As you look away, a ghostly image flashes into your vision so fast it’s hard to be sure you haven’t imagined it. But repeating the experiment proves it – for the LED is designed to project a face into your peripheral vision, meaning you only see it as you glance away. The face is, of course, that of SK himself, immediately recognisable once seen. In fact, Kubrick’s face (and in one case, whole body encased in snow), is another recurring them of the show. And why not? It’s nice to be reminded of the man behind the lens. The two rooms I enjoyed the most were, firstly, this one, by Doug Foster, which is not the slitscan sequence from 2001, but a modern version of it, and very beautiful it is too. Sitting on a bench in a dark room, it would be easy to while away a couple of hours in a trance in front of it. …And the second one was this, by Jane and Louise Wilson, based on one of the most famous of the movies that Kubrick never managed to make; Aryan Papers. 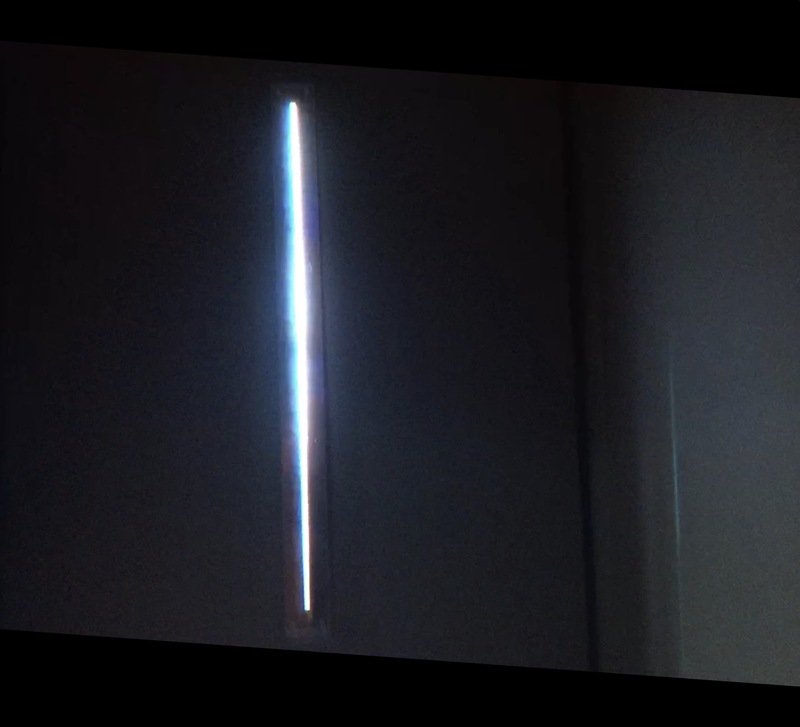 Using stills from Kubrick’s infamously intensive research process, the Wilsons simply project image after image with a simple voiced description of what the photo contains. 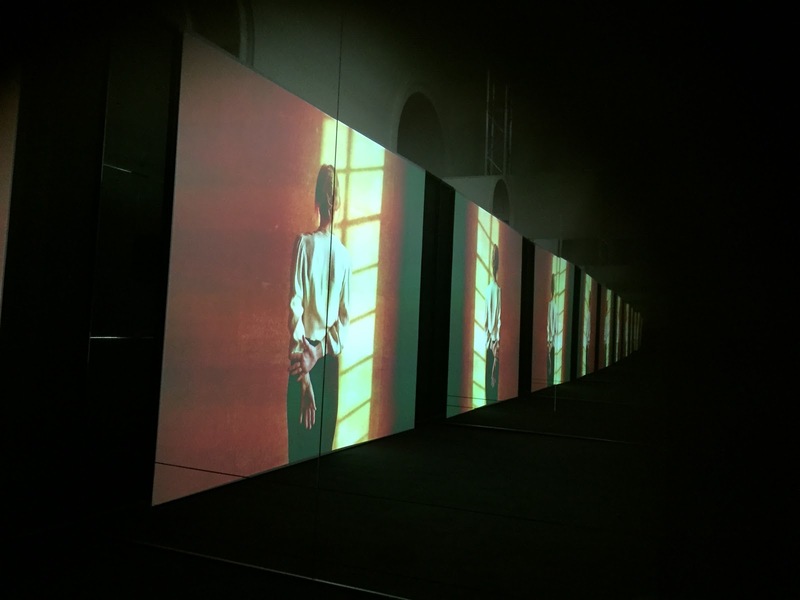 Many of the images and film clips are of Kubrick’s chosen actress, Johanna ter Steege. 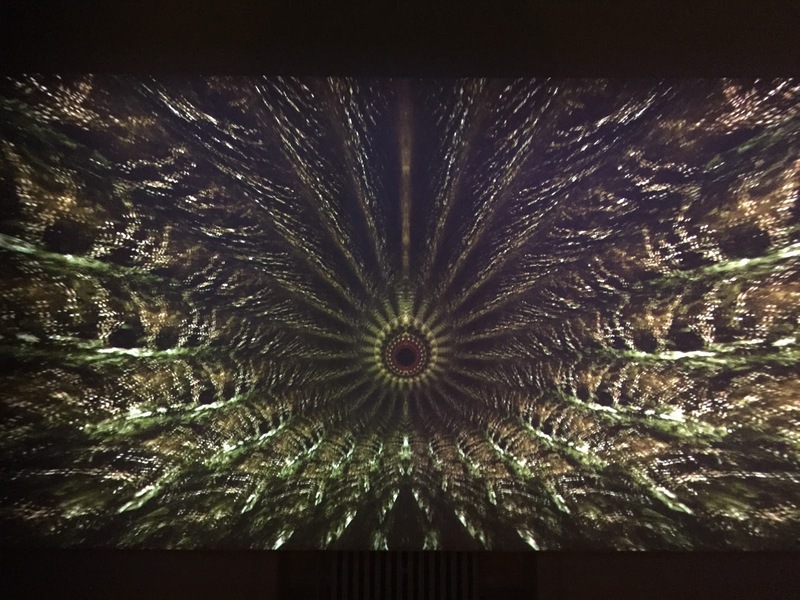 What lifts this simple idea to something mesmerizing are the mirrors on either side of the projected images, leading to a curving infinite repetition on both sides as you gaze at Kubrick’s work in progress. When the shots becomes those of Jews in the ghettos of Poland, and one thinks of the horror that befell many, many individuals, the weight of this infinite repetition starts to give a tremendously unsettling tone.